We didn’t own a pogo stick since we had a gravel driveway which didn’t have a good surface for using one. My good friend Penny, however, owned one and I used it at her house. This picture accurately portrays the outfit I would have been wearing to jump. However, there the similarity ends. This little girl and boy seem to defy gravity, making a deft series of hops, all the while staying upright and smiling. Me–not so much! Even getting on a pogo stick required a certain grace. Somehow while keeping the pole upright, you had to put both feet on the little step which was about 12 inches off the ground. As soon as you were on the thing, you needed to begin hopping in order to stay on it. I spent most of my time trying to get on the stick and picking myself off the ground after I fell off the stick. Penny and I quickly found something else to do. Fortunately, her father had built her a set of wooden stilts. While these required some of the same agility as the pogo stick, at least once you were on them you could step, not hop, across the yard. I enjoyed the stilts more than Penny. I was always one of the shortest girls in my class. For a short while, I could tower over my playmates! I remember thinking how wonderful a Pogo Stick would be and then I actually got one; Though it was fun, somehow it didn’t quite live up to the hype. Maybe a trampoline would have been better for flying high! I don’t think anyone I knew had a trampoline. I never tried one until I was an adult at the YWCA. It was certainly fun and I would have loved it as a kid. I can empathise. Balance was always a challenge for me once both feet left terra firma. 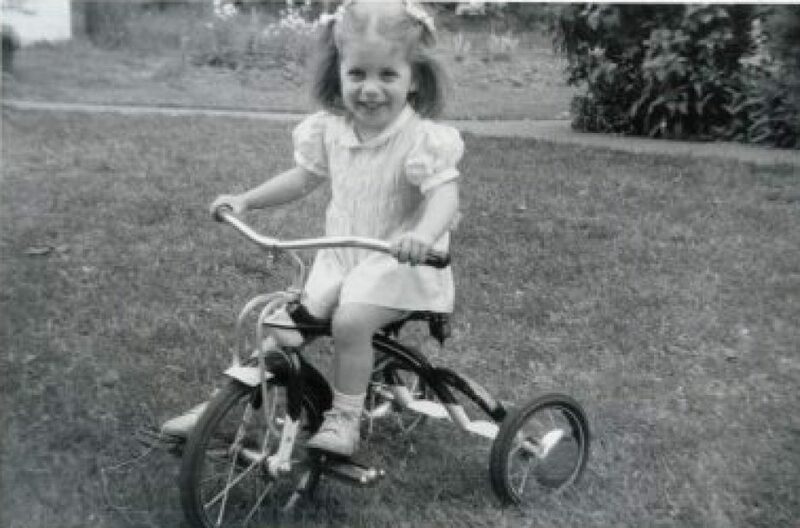 I took ages to learn to ride a two-wheeled bicycle at the age of twelve (when we moved out of London and it was deemed safe for me to have one) and skating brought only bruises. A pogo stick was a lost cause from the start. My youngest daughter shares my lack of body confidence and never did get the hang of skiiing, to the point that her instructor feared for her safety on the nursery slopes, given her determination. I once had her ‘I can do this’ mentality (in spite of all evidence to the contrary) but these days I’m more likely to tell myself, ‘I don’t have to do this any more’. Great last line. I am going to remind myself of that next time I think I “should” try something. Those are both tricky to do! I remember trying a pogo stick a few times and getting nowhere, but never tried stilts. There are many folks who easily move around on them these days at renn faires and conentions and that sort of thing, indoors and out, but it is not anything I would find fun or safe-feeling myself. I do admire those who can do it and who enjoy it. I didn’t realize that people actually move around on them as adults. That would be fun to see. Those are wonderful. I encourage everyone to click those links she provided. Too fun. This post brings back wonderful memories of pogo sticking (Is that a word?) when I was a kid. I used to think that using a pogo stick was like a bicycle -and that once you learned how to do it, that you never forget. I was wrong. A few years ago, I found my old pogo stick and tried it again. It promptly threw me off and I landed in a pile on the ground. You probably hadn’t counted on being so much taller. I figure it worked better with a lower center of gravity. I have lots of handy reasons I can’t do things I used to be able to do! You were a better girl than I in that respect! I am amazed by that boy. He must have been very balanced! I remember pogo sticks and stilts so well. I could not balance well enough on a pogo stick but I did master walking on stilts – though rather ungainly! I wonder if anyone ever mastered the pogo stick. I’m glad you get to remember that gift of your grandfather. I am tickled that you learned to walk on stilts and enjoyed it! I never had the experience to try. But those darn pogo sticks….! I don’t know if the springs were too stiff because we could never give them enough of a workout to loosen them up or what – but it was quickly abandoned for the reasons you state! Maybe we didn’t weigh enough! Haha – I didn’t think about that!